Ingo & Emmet is a Supporter that lets you look at the top card of your deck. Sounds useful, right? No? Well, there’s another part of the effect in case you were about to tear up your train ticket. It can discard your hand and draw 5 cards either from the top or the bottom of your deck. It’s like trying to figure out which of the brothers is better, Ingo or Emmet. They’ll probably insist it’s both. But you only get to choose one. Personally, I think this is the best card in the set. It’s like Sycamore, but you get to check out the top card of your deck before you figure out where you wanna draw cards from! And there are some effects that may specifically put cards at the bottom of your deck, in which case the second effect can be really useful if you play around it. Worst case, you get to look at the top card and make a call as to whether or not you need that one card or not. It’s just an interesting way of approaching draw power! But does interesting make it good? Well, compared to Sycamore, the card just doesn’t draw you as many cards. But unlike Cynthia, which draws you one more card, Ingo & Emmet will let you feed your discard pile with more cards to fuel up your various plays. So take that as you will, and keep Ingo & Emmet in your heart. But remember: you can only choose 1 good Supporter. …unless you run all the good Supporters. Arora Notealus: Okay, so technically, they’re the Subway Bosses, and subways are technically different from metros. Metro is meant to refer to any rapid transit system in an urban area, either below ground or above ground, and subways are specifically those that are underground. Just think of it like squares and rectangles – all squares are rectangles, but not all rectangles are squares. Similarly, all subways are metros, but not all metros are subways! And in that sense, Ingo & Emmet are still two weird twin brothers working on a train all the live long day. Next Time: Alright, who beat out my #1?…oh that makes sense. Our fourth place pick is Battle Subway bosses Ingo & Emmet! I actually did not have the opportunity to battle them inside the Battle Subway (outside of a mandatory battle outside of the facility with a counterpart character) because I cannot maintain my win streak. Obvious reasons include using my in-game team with bad move sets or using good ones but falls short of stats such as EV and IV. Another layer of complexity is the AI having good Pokémon with proper stats and movepool. So trying to battle them is out of the question. I didn’t know how important IVs and EVs are until when I played XY. For the TCG version of those guys, I had them as my first place pick because it brings another aspect to the table from existing cards. Being a Supporter means you only get to use one per turn unless you played Lt. Surge’s Battle, which enables you to play three Supporters during your turn. Although anti-Supporter cards are few, some mentions include Stoutland BCR and Kabutops SM Team Up that prevents you from playing it….if they’re in the Active spot. So what do they do? You get to look at the top card of your deck and do one of the two options: Discard your hand and draw five cards from the top of your deck OR from the bottom of your deck. This is the aspect that I was talking about: they bring another discard based draw. 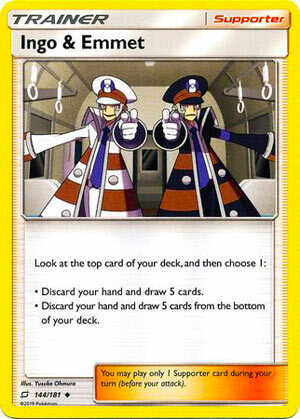 If anyone knows about Professor Juniper, Professor Sycamore, Base Set Professor Oak, or even Sightseer, then you should know by now that discard based draw is one of the most powerful effects a card can have due to digging through your deck deeper without having to put cards from your hand back into your deck. It’s not always the best action to do if you can’t afford to discard those cards that you may need later on, but if you have no choice but to do it, then you better have some recovery cards to get certain stuff back. Perhaps some types of cards that’s hard to get it back after you played them is item cards. All other categories can be recovered in some way. Rescue Stretcher for Pokémon; Energy Recycler and some abilities for energy cards; Lusamine or Pal Pad for Supporter and Stadiums. I forgot to mention how useful it is to look at the top card of your deck. Just by looking at it can make you decide whether or not you want to draw from the top or the bottom. Strategies revolving the top card of your deck can be beneficial. If it was a basic energy, then Magcargo-GX or Zoroark-GX can choose to fetch it if desirable. You would have no choice but to draw the bottom cards from your deck if you wish to remain the top card as is. Magcargo’s Smooth Over will guarantee that the one card that you searched will be on the top card of your deck, making Ether or Max Elixir consistently get energy….or that it’ll be drawn by Ingo & Emmet. Besides that, the decision can go either way. If Oranguru’s Resource Management grabs three cards from he discard pile into the bottom of your deck, then they will exactly get you those plus two random cards on your next turn…..if your deck wasn’t shuffled. Overall, these guys are flexible! I am confident that Ingo & Emmet will be one of the big draw Supporters alongside Cynthia, at least for the Standard format. History has repeated once more, with both formats not being much different as they now have both shuffle-and-draw and discard based draw. They will most likely being used at a full four count. In the Expanded format, Professor Sycamore/Juniper still dominates as the premier draw Supporter, though not all decks run a full four count. However, the professors only discards and draw the top 7 cards of your deck; Ingo & Emmet does more than that, even if the draw power is weaker. So I don’t consider those Subway Bosses to be outclassed; it also has a place in Expanded as well. Due to extreme competition in the Expanded format based on the card pool, their usage can be pretty spare. In Limited, if you pulled one, it is a must run simply because this is a Supporter that draws a good amount of cards, especially on a 40-card deck. Ingo & Emmet brings another discard based draw into the table, and with Dedenne-GX right around the corner, the Standard format will be just be fast paced as the Expanded format. Definitely grab a playset for those for both formats, as you may never know when you need it over the other. This card would’ve been the third best card as well because another card tied in voting points. You then decide whether or not to take five cards from the top of your deck or the bottom. If you have a lot of insta play cards – or if you’re running a deck with Oranguru (UPR), Ingo & Emmet has some upside. For Oranguru, you would probably prefer it to Looker (UPR) because it gets you two additional cards and you can always potentially recycle the cards you had to discard when playing I&E. For insta play cards, obviously, it hurts a lot less to discard one or two cards than it does to discard five or six. Personally, I’ve yet to put this into a decklist, and I can’t see myself doing that for a while. I rarely play Oranguru UPR, and if I have that many insta play cards, I’m probably going to play Lillie instead. Basically, if I discard my hand, I want to put seven cards in it, not five. I don’t care that you give me the option of choosing the top or bottom of my deck. I don’t care that you let me see the top card of my deck. I want seven if I have to dump my hand. Five isn’t enough. So our quest for a complement to Cynthia continues. Ingo & Emmet and Erika’s Hospitality both fall short of the high standard we have for draw Supporters. Looks like we’ll have to continue to rely on abilities and Item cards to put additional cards in our hand. As we countdown our top picks of SM – Team Up, fourth-place goes to two characters. Oh, it isn’t a tie; I’m talking about Ingo & Emmet (SM – Team Up 144/181, 176/181)! Which you already knew, given that I’m the fourth review on this page AND you’d have needed someone to blindly link you given we make things quite clear on the front page and in the very URL. Ingo & Emmet is a Trainer-Supporter, so it has quite a bit of direct competition, let alone incidental… and that is before considering anything else from the rest of SM – Team Up. This latest set actually has a few cards that affect Trainers in general, as opposed to a specific subclass like “Item” or sub-subclass like “Pokémon Tool”. It isn’t that we haven’t had those before, it is just we haven’t had any worthwhile examples of this in Standard for a little while, and don’t really have any good examples of anti-Trainer effects even in Expanded, so even just getting two of each in one set is exciting… while making it harder to predict how this will affect everything else. Especially for Supporters, given that they received a major new counter in the form of Kabutops (SM – Team Up 78/181), unless my fear that I badly overrated it is completely justified. If things remain business as usual, Ingo & Emmet are still fighting for deck space against established cards like Cynthia, Guzma, Lillie… there are so many and that is before we consider the other Supporters released in this expansion! Ingo & Emmet first let you look at the top card of your deck, then you choose between one of two effects, both of which require discarding your entire hand. Either you draw five cards, which includes the card you just saw as one of the five or you can draw the bottom five cards from your deck, which means the card you saw remains on top of your deck. Drawing five cards is solid, but not exceptional; it wasn’t good enough for Shauna back in the day, but it has worked for Tate & Liza, due to the differences in the cardpool and that duo’s additional effect. How about Ingo & Emmet’s non-draw effects? By the time you see what is on top of your deck, you’re already committed to discarding your hand. This “heads-up” just gives you a little help in deciding whether to draw from the top or the bottom… and maybe a little something else under special circumstances. The obvious thing is to draw from the top if the revealed card is something you need and to draw from the bottom if it is something you don’t need, just because you’ll have five “chances” to get whatever it is you do need drawing from the bottom than the effective four “chances” you have in drawing from the top (since you know the topmost card is a dud). You can also use effects to stack your deck, either on the top or the bottom. Most of the time, you’ll then draw from whatever you stacked but you might have a combo where you actually need the stacked cards to remain for something else. A weak-but-simple example; you see a basic Energy on the top of your Expanded-Format deck, so you draw the bottom five in the hopes of striking a Max Elixir to then attach that basic Energy to one of your Benched, Basic Pokémon. To use Ingo & Emmet well, a deck doesn’t have to be completely built around them, but certain strategies lend themselves to this duo better than others… and those decks have other options they’ve already been using: Cynthia Judge, and Tate & Liza if shuffle-and-draw is acceptable, with Cynthia having the best yield but the other two offering potentially useful added or alternate effects. Lillie and Sightseer, if you can burn through your hand easily. Sightseer (again), Sophocles, and/or TV Reporter if it is about discarding some cards while also drawing. Looker, which only draws three cards from the bottom of your deck but can take advantage of Looker Whistle. That’s just the draw Supporters Ingo & Emmet have to compete against; there are Item, Stadium, and Pokémon-based effects that can help you with discarding cards you need in the discard pile and/or getting certain cards you need into your hand. In Expanded, there are more options, including Professor Juniper and Professor Sycamore; whether the powers-that-be think those two are too good for Standard or just thought Standard needed a change of pace, they’re still part of the Expanded Format. They also suggest that the combination of seeing the top card from your deck and being able to draw from the top or the bottom of your deck is worth drawing two fewer cards. I don’t think I agree, but not by a huge amount. Ingo & Emmet are a good addition to our Supporter options for the Standard Format, a decent addition to them in Expanded, and most welcome should you pull one for a Limited Format event. The tone of this review may seem negative, but I actually like Ingo & Emmet as a card, just not enough for it to have made my own top 11. Perhaps it should have, but not only are most decks finding it worthwhile to run non-Supporter draw (or search) effects in significant amounts, I don’t see Ingo & Emmet replacing all of their direct competition like Cynthia, Sightseer, etc. I could see a copy or two of Ingo & Emmet making it into most decks, but they’ll only shine in certain ones. Admittedly, that maybe the new norm for draw Supporters.